Today we’re tapping into my Central American roots with a Central American Salad In A Jar! Sweet, savory, creamy, crunchy. Serve it as a side when grilling out with family this summer, or pack it up into jars and take it with you on-the-go! When it comes to healthy eating, it’s all about making easy recipes with fresh and quality ingredients. Especially now that back-to-school season is approaching! Not that I have kids going back to school, or really know anything about the chaos of that season….but it seems that everything just gets busier this time of year! Am I right?? For this recipe, I wanted to find really good and fresh peaches. I actually have a pretty hard time finding fresh peaches (ohhhh the struggles….) because it seems that they’re always super overripe! I was so happy when I found them in perfectly ripe and fresh condition at Kroger, who also happens to have an amazing selection of locally sourced produced! It’s the best for when you’re needing fresh and local products. Not to mention they have an awesome rewards program that allows you to download digital coupons and earn points towards their fuel program with any purchase, letting you save on fuel just by buying what you always use! This is super exciting for Cody and I since we have lots of road trips coming up (as always). While I was there I also loaded up on some road trip snacks! Because, let’s face it, what’s a road trip without snacks? In this case, I prepared for a healthy road trip with delicious energy bars and berries. 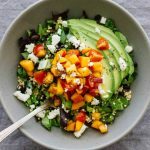 If you’re going on a road trip soon, head over to Kroger to load up on healthy snacks, sign up for a shopper card, and grab some fresh peaches to make this delicious Central American Salad In A Jar! So the parts of this salad that I consider “Central American” are the black beans, the queso panela, avocado, and quinoa. Quinoa is definitely not latin (haha), but I used it as a healthier alternative to rice! I grew up eating Gallo Pinto almost every day, which is a combination of those ingredients. This healthy Central American Salad In A Jar is a little taste of home and sweet times with my family! I added a little bit of a twist to this salad by creating a peach salsa because SUMMER, y’all! In making this salad, start with the peach salsa. Finely chop the peaches and tomatoes, add the chia seeds, and place them in the jar first. Then add the quinoa, black beans, avocado, queso panela, and finely chopped lettuce. Done! SO easy, right? Finely chop the peaches and grape tomatoes. Add chia seeds to the salsa. Cook the quinoa according to directions. While the quinoa is cooking, chop the avocado and lettuce. In a jar, layer the salad by filling the jar with the peach salsa first. Then add the quinoa, black beans, avocado, queso, and lettuce. Refrigerate until ready to serve. Pour out the salad into a bowl and enjoy! So smart!! Looks so easy but still so delicious! Love fresh summer salads like this with bright, colorful produce. Summer is the best time for making salads and you often don’t even need dressing! This looks beautiful! Thanks, Karen! It really is! 🙂 Enjoy! What a great idea! Remember, if you cut your lettuce with a knife, it will turn brown on the edges by the next day. If course, the avocado will turn brown as well if not dipped in lemon juice, so I’m not sure how pretty this salad will be in 24 hours! However, if I make it at night to take the next day for lunch, it should still look ok. I’ll try it as soon as I find some organic peaches!